The State Department used a little logic to squeeze a handful of e-mail providers into a single program. 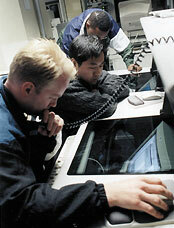 Security experts in the department's Network Control Center scrutinize traffic and performance. Through a project dubbed A Logical Modernization Approach (ALMA), the IRM Bureau installed an unclassified information technology infrastructure for all of its overseas missions and upgraded their systems, chief information officer Fernando Burbano said. The upgrade was crucial. Department employees send roughly 20 million e-mail messages a year. The department completed the project in September; it will re-evaluate and upgrade the post's servers and software every three years to keep the systems current, said Haywood Miller, ALMA program manager. 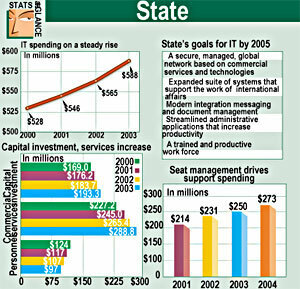 State plans to upgrade routers, switches and PCs every four years, Burbano said. The consolidated mail system improves State's ability to collect, analyze and transmit information, Burbano said. The project also resolved two of State's biggest IT problems: unreliable e-mail and antiquated computer equipment, he said. The program replaced roughly five different e-mail systems, making messaging easier to manage, Burbano said. ALMA also provides a centralized and timely way of recording traffic between the department and its overseas posts. 'It gets rid of multiple e-mail systems and replaces the proprietary Wang [VS] minicomputer system with industry standard,' Miller said. ALMA uses three Compaq ProLiant 3000 servers running Microsoft Windows NT 4.0 and Microsoft Exchange Server 5.5 for e-mail, Miller said. End users' PCs vary but all run NT and use Microsoft Outlook for accessing and sending e-mail, he said. State's 10/100-Mbps switched network gives users a 100-Mbps backbone and supports 10-Mbps bandwidth to desktop PCs, he said. Although State finished the messaging and hardware upgrades in the fall, it had begun them nearly three years before. It's already time to replace equipment in some posts, Miller said. 'With the program, we go back every three years and refresh the equipment,' he said. Some of the posts that received the initial ALMA upgrade are still running old PCs, he said. As part of the upgrade, installation technicians tune system performance and tutor each post's staff on skills needed to maintain the NT environment, Burbano said. This year, State expects to spend approximately $9.6 million on ALMA. Of that, $200,000 will go to software and more than $1.8 million to new servers. The program will require roughly $11.5 million for upgrades next year and will cost nearly $60 million through fiscal 2004, State estimated. ALMA is the department's first major modernization initiative since the early 1980s, when it rolled out Wang VS minicomputers worldwide, Burbano said. The ALMA program also centralized technology buys, he said. IT procurements had been handled at the post, but under ALMA, funds that the posts would have used to buy desktop systems were transferred to the program budget. Burbano said that gave State the opportunity to leverage its buying power and save the department $20 million over five years.